Whether it’s bangers and mash, a sausage with a fry up in the morning or sliced chorizo with a roasted chicken thigh, we all love sausages. 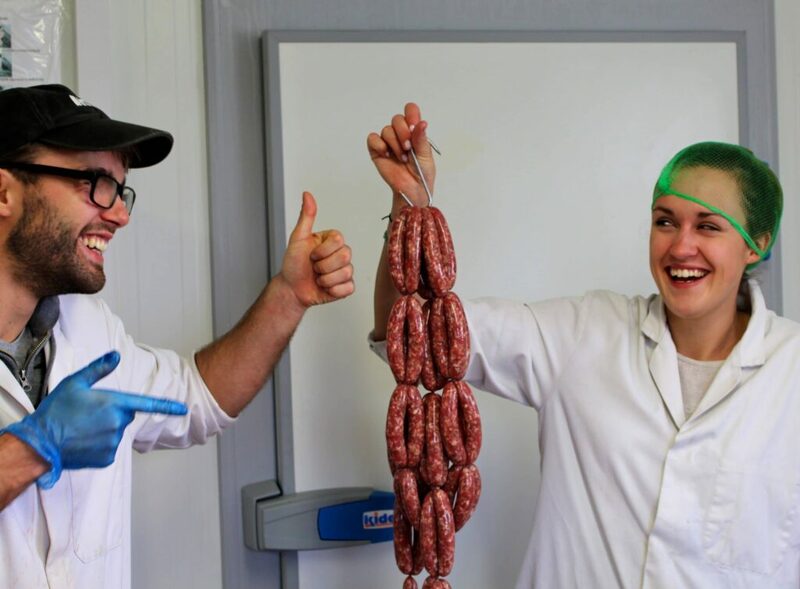 Here at the farm we have been making sausages with our grass fed rose veal and kid goat for years and have lots of fun coming up with new flavours. So, in celebration of a good sausage we thought we’d put together this little guide to sausages, what they are, how they’re made and some different types. So, what is a sausage? Ok let’s start at the beginning. Sausages have been eaten since the ancient Roman times and came about as a way of using up all of the animal. Traditionally scraps from the butchery process would have been minced with preserving spices and placed into the intestines of the animal. Sometimes the sausages were then dried. Merguez- a spicy sausage flavoured with harissa, paprika or sumac. Boerewors- a South African sausage made with mixed meat (pork, game, beef) and seasoned with coriander. Chorizo- a spicy sausage with plenty of paprika. Bratwurst-a German sausage made with pork or veal often spiced with ginger, nutmeg and caraway. Kielbasa- a polish sausage with flavours of garlic, pimento and cloves. Loukaniko-A Greek pork sausage with orange peel, fennel and herbs. Prieta- a Chilean sausage with onions, spices and walnuts. What is in a sausage and what’s the skin made of? 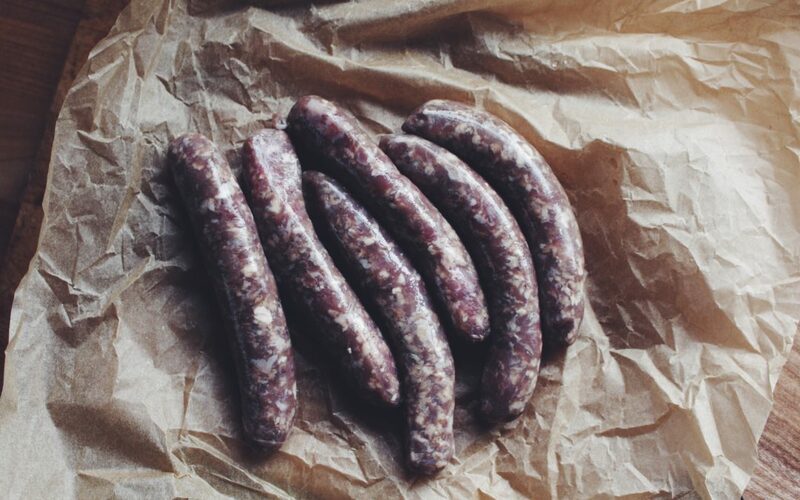 A good quality sausage usually is a mixture of quality off cuts and contained in a natural skin or casing not a plastic or artificial alternative. There can also be rusk or breadcrumbs in sausages to help keep the sausages shape and a mixture of seasoning and spices. We use gluten free rusk in our sausages. How do you make a sausage? 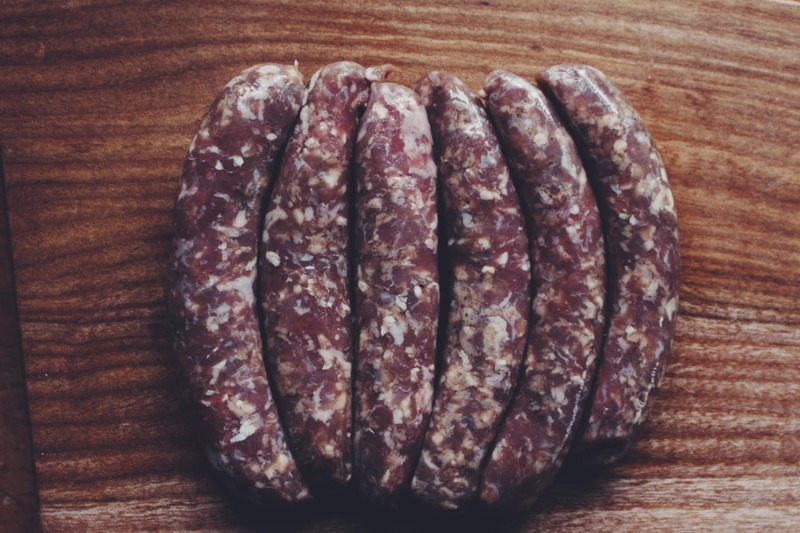 Here in our artisan butchery we make sausages on Wednesday after the main butchery has been done and we have a selection of lovely off-cuts to put to good use. We begin by popping all the meat through a mincer and then mix the mince together with a blend of spices and seasoning as well as some gluten free rusk. Once its all combined it’s time to pop some soaked skins or casings onto the sausage making machine and fill the casings carefully with the meaty mix. Once we have a good amount filled we then hand link each section into the perfect size and pop them into a packet to bring to market or send out in our meat boxes. We also teach how classes on how to make sausages throughout the year. Are sausages good for you? There’s a bit of a myth about sausages being a bit unhealthy but personally we cant see why. A good quality sausage should contain good meat, some fat and spices and not too much salt. What recipes can I make with Sausages? Any others we’ve missed let us know in the comments below! In general a sausage takes about 20 mins to cook. Baking them is always a fool-proof way to cook a sausage and it wont fill your kitchen with smoke either. Simply preheat the oven to 180C. Separate each sausage and prick them with a sharp knife. Cook for 20 mins and make sure they’re cooked through. If you want to cook sausages in a pan, just heat a pan with a tbsp olive oil and add your sausages to the pan. Cook for about 6 minutes on each side and until they’re brown and cooked through. So, where can I buy good sausages in Ireland? Gubbeen Chorizo is delicious and made in Ireland (Corndale is also great for a smoother chorizo). 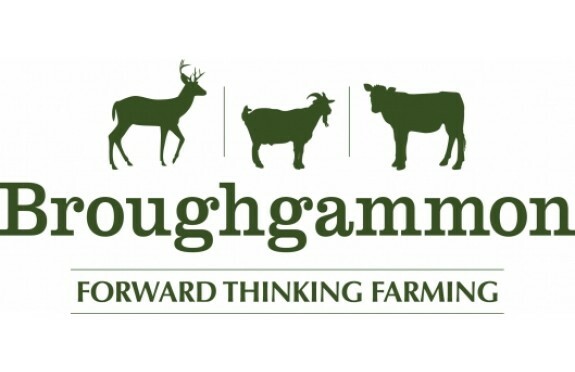 We also are pretty proud of our own Broughgammon sausages made with ethical meat and with a great variety of flavours including Merguez, Goat Chorizo, Goat Za’atar, Rose Veal Breakfast, Rose Veal and Goat Boerewors, Rose Veal Fennel and Pepper and also Rose Veal with Lemon Balm and Prosecco. Yum! We’re at Temple Bar Food Market each Saturday, St. George’s Market and also post throughout the UK and Ireland. You can also find our friend Jane Russell’s range of sausages in most good delis throughout Ireland. Have anything sausage-y to add? Let us know in the comments below!